[INQ. NO. 1510M36] ADM21’s latest windshield wiping technology is being widely applied in making driving safer than ever. 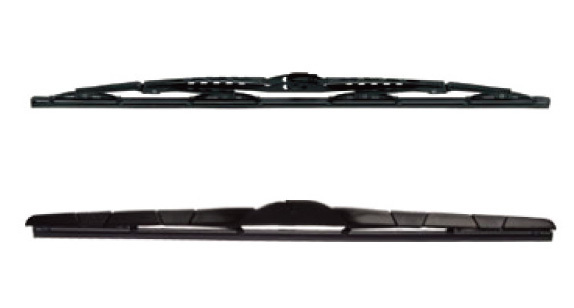 The maker’s most visually advanced wiper blade is the “flat” blade, which gives exceptional visibility. The absence of hinges and joints prevents the buildup of snow and ice, thus contributing to longer product lifespan. More importantly, the precise tension of “flat” blades gives an accurate fit over the curvature of the windshield ensuring quiet, soft, and excellent wiping capabilities. The company has specialized in supplying the highest level wiper blade products, in terms of their excellent quality, well-priced, durability, sleek and robust design, actively exporting them to over 100 countries worldwide, especially to North America and the EU. Currently two main blade items – AB4 conventional blade, XF4 flat blade – are under mass-production for meeting the continuously rising demand especially in the local market. The company currently mass-produces conventional blades and flat blades, and hybrid blades combined with conventional blades and flat blades. There is also an all-in-one adaptor compatible with the existing arm and renowned automaker’s arm, which further enables the user to easily install it in its designated place regardless of the kinds of arm joints using one adapter. The fullfledged adaptor employs nano coating technology featuring highest-quality. As one of the leading pioneers in the field, its exports have recently reached more than $50 million in sales volume, up slightly from the same period of last year. Now we invest nearly 10% of the yearly basis revenue in R&D to cope with the current and potentially anticipated sluggish global market – based on the fact that investment in R&D will eventually secure future competitiveness in spite of no guaranteeing of short-term profit. “There are 300 kinds of finished products, with 2,500 parts made using our technology. As the numbers of the required parts are less than those of other products, our products secure high price competiveness along with superior durability. And our market share is surprisingly higher than that of global companies including BOSCH,” he explained. [INQ. NO. 1410M08] ADM21’s latest windshield wiping technology is being widely applied in making driving safer than ever. The maker’s most visually advanced wiper blade is the “flat” blade, which gives exceptional visibility. The absence of hinges and joints prevents the buildup of snow and ice, thus contributing to longer product lifespan. More importantly, the precise tension of “flat” blades gives an accurate fit over the curvature of the windshield ensuring quiet, soft, and excellent wiping capabilities. 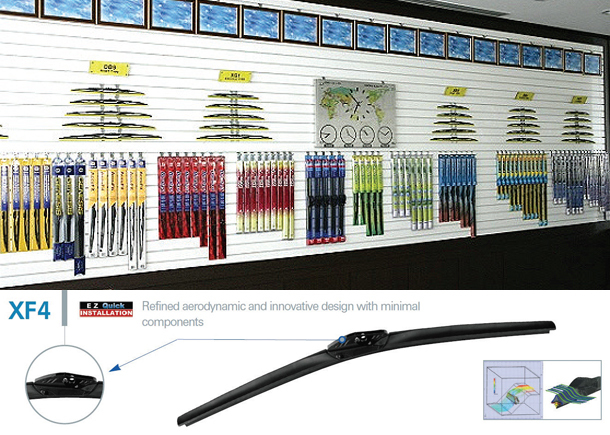 The company has specialized in supplying the highest level wiper blade products, in terms of their excellent quality, well-priced, durability, sleek and robust design, actively exporting them to over 100 countries worldwide, especially to North America and the EU. Currently two main blade items – AB4 conventional blade, XF4 flat blade-are under mass-production for meeting the continuously rising demand especially in the local market. The company currently mass-produces conventional blades and flat blades, and hybrid blades combined with conventional blades and flat blades. There is also an all-In-One adaptor compatible with the existing arm and renowned automaker’s arm, which further enables the user to easily install it in its designated place regardless of the kinds of arm joints using one adapter. The full-fledged adaptor employs nano coating technology featuring highest-quality. Now we invest nearly 10% of the yearly basis revenue on R&D against current and potentially anticipated deteriorated global market – based on the fact that the invest on R&D will eventually secure future competitiveness in spite of no guaranteeing of short-term profit. [INQ. NO. 1408M07] ADM21’s latest windshield wiping technology is being widely applied in making driving safer than ever. The maker’s most visually advanced wiper blade is the “flat” blade, which gives exceptional visibility. The absence of hinges and joints prevents the buildup of snow and ice, thus contributing to longer product lifespan. Currently two main blade items – AB4 conventional blade, XF4 flat blade are under mass-production for meeting the continuously rising demand especially in the local market. The company currently mass-produces conventional blades and flat blades, and hybrid blades combined with conventional blades and flat blades. There is also an all-Inone adaptor compatible with the existing arm and renowned automaker’s arm, which further enables the user to easily install it in its designated place regardless of the kinds of arm joints using one adapter. The full-fledged adaptor employs nano coating technology featuring highest-quality. ADM21’s latest windshield wiping technology is being widely applied in making driving safer than ever. The maker’s most visually advanced wiper blade is the “flat” blade, which gives exceptional visibility. The absence of hinges and joints prevents the buildup of snow and ice, thus contributing to longer product lifespan. Currently two main blade items – AB4 conventional blade, XF4 flat blade – are under mass-production for meeting the continuously rising demand especially in the local market. The company currently mass-produces conventional blades and flat blades, and hybrid blades combined with conventional blades and flat blades. There is also an all-In- One Adaptor compatible with the existing arm and renowned automaker’s arm, which further enables the user to easily install it in its designated place regardless of the kinds of arm joints using one adapter. The full-fledged adaptor employs nano coating technology featuring highest-quality. [INQ. NO. 1307M09] ADM21’s latest windshield wiping technology is being widely applied in making driving safer than ever. The maker’s most visually advanced wiper blade is the “flat” blade, which gives exceptional visibility. The absence of hinges and joints prevents the buildup of snow and ice, thus contributing to longer product lifespan. Currently two main blade items – AB4 conventional blade, XF4 flat blade – are under mass-production for meeting the continuously rising demand especially in the local market. The company currently mass-produces conventional blades and flat blades, and hybrid blades combined with conventional blades and flat blades. There is also an all-In-One Adaptor compatible with the existing arm and renowned automaker’s arm, which further enables the user to easily install it in its designated place regardless of the kinds of arm joints using one adapter. The full-fledged adaptor employs nano coating technology featuring highest-quality. As one of the leading pioneers in the field, its exports have recently reached more than $50 million in sales volume, up slightly from the same period of last year.